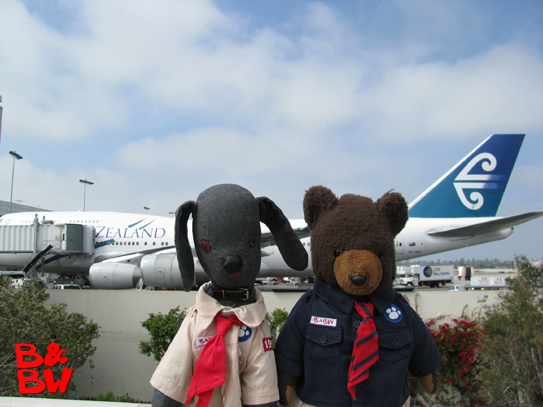 The boys made their second trip to the southern hemisphere in April 2008 when they headed for New Zealand and Australia. After a quick over-night in LA and a visit with their friends on the set of Entertainment Tonight, the boys headed to LAX to catch their Air New Zealand flight to Auckland. 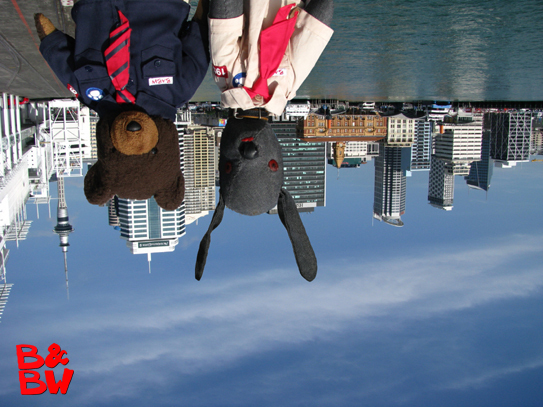 The trip to the other side of the world left the boys feeling a little topsy turvy for the first while. Move your cursor over the photo to see the boys right-side up. After a few hours the boys adjusted to being "upside down" and Bow Wow's ears finally settled down. Their room at the Sebel Suites (top left) in Auckland offered a great view of Viaduct Harbour. 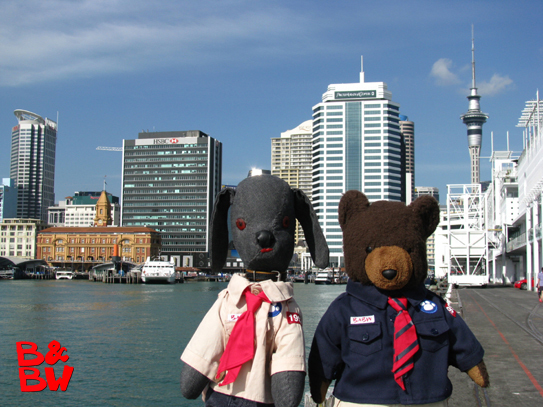 Never one to shy away from a little derring-do, adventuresome Bear was undaunted by the 192 m height when he signed up for the Sky Jump at Auckland's Sky Tower. 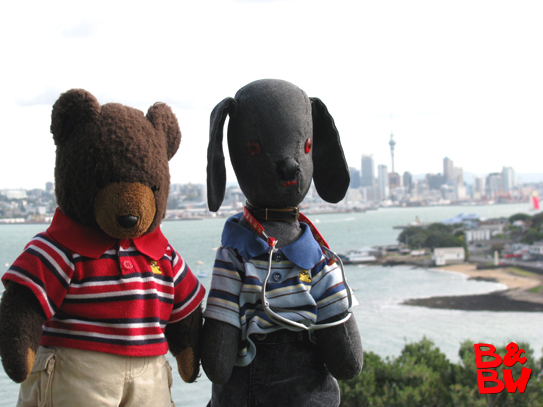 The boys explored picturesque Devonport on the north shore of the harbour. 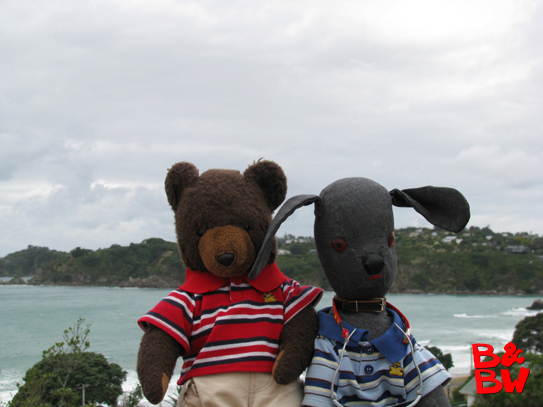 Bow Wow does his best Flying Nun imitation in on windy Waiheke Island. 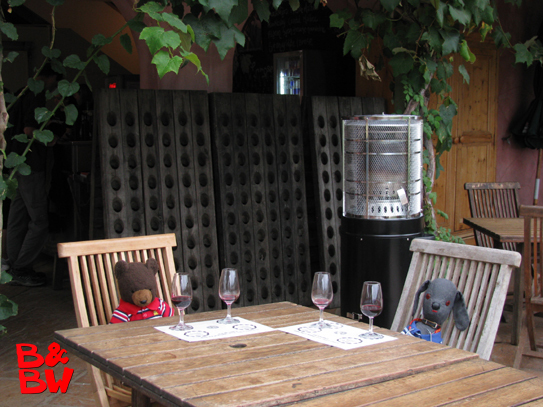 The whole point of the trip to Waiheke Island was to visit some of the many wineries. 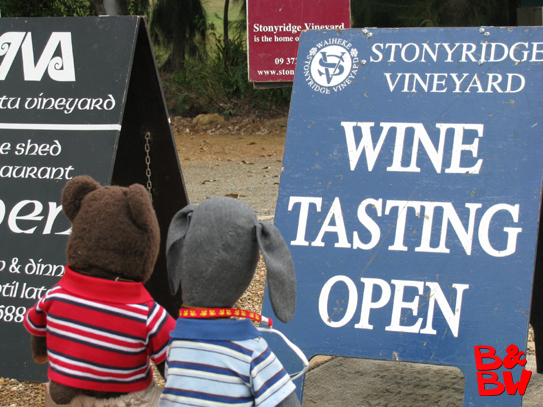 The boys started to get a little tipsy after a few glasses at Stonyridge vineyards. 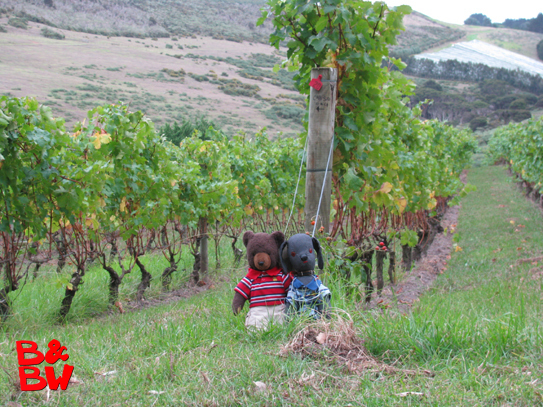 Taking a stroll through the vineyard to sober up. Move your cursor over the picture to zoom in. 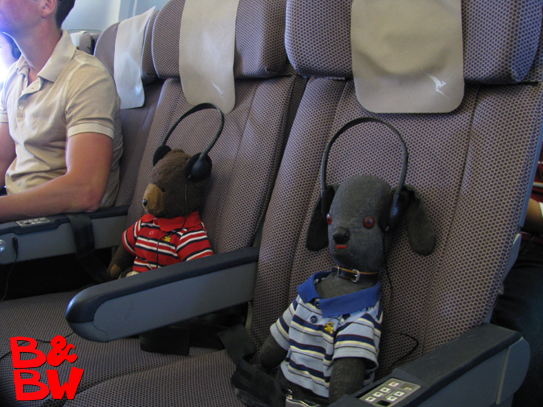 The boys were not impressed with their seats in the "back of the bus" on Qantas from Auckland to Sydney. Without their own personal video screens, that they've become accustomed to, they couldn't see the main screen over the seat backs in front of them. 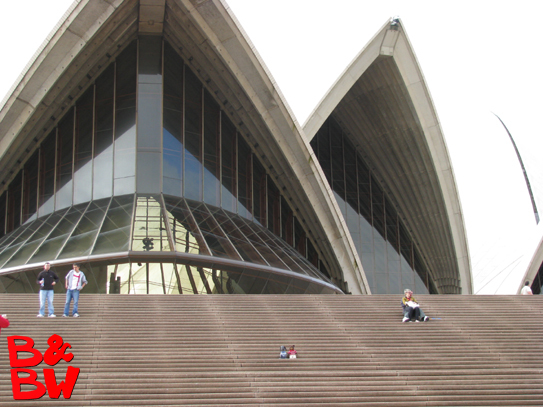 First stop: Sydney Opera House. Move your cursor over the picture to zoom in. 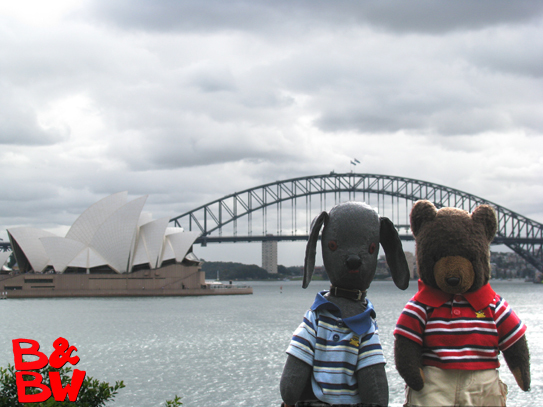 Like every other visitor to Sydney, the boys had to have their picture taken with the Sydney Opera House and the Harbour Bridge in the background. 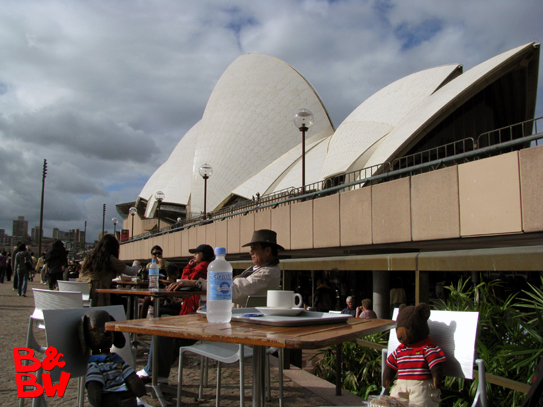 The tables and chairs at the Sydney Opera House cafe were not made for the vertically challenged. "Two schooners of VB, please." 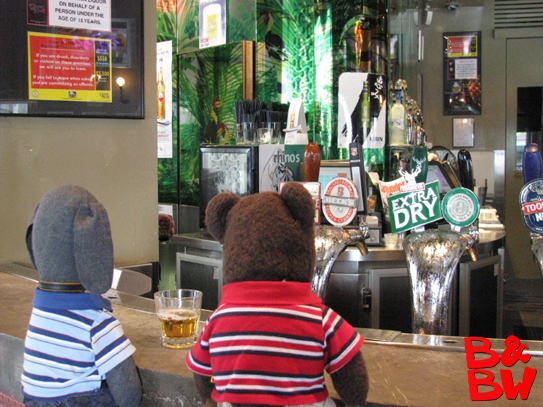 With all the pubs, or "hotels" as they're called in Australia, the boys never went thirsty. Move your cursor over the photo for a different view. 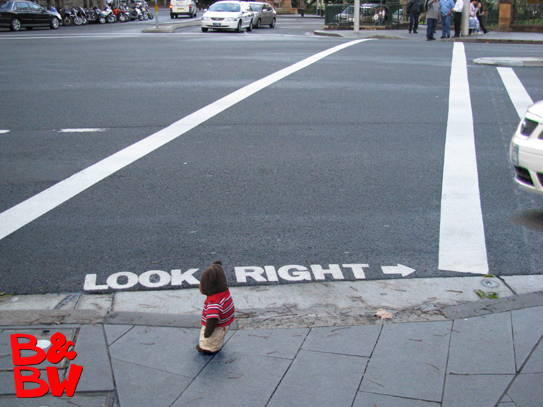 A creature of habit, Bear never got used to the fact that because cars drive on the left in Australia and New Zealand, you have to look right first before crossing the street. The boys put together an audition tape that they hope will get them selected as contestants on the next edition of the Amazing Race.